After reading part one, you’ll know that Scott Fuller is the amazingly talented graphic designer behind The Studio Temporary, and man to credit for the Furrow Books logo and belly band designs. This is the second and final part of the interview. 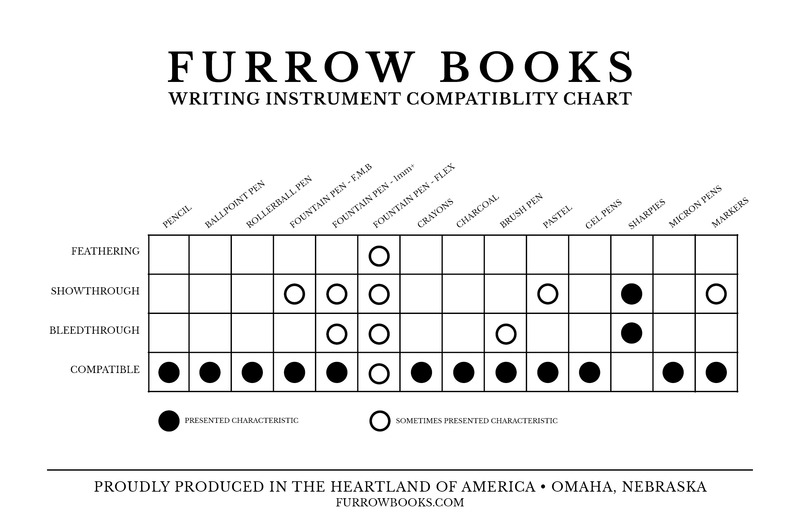 What were your thoughts and ideas behind the Furrow Books logo? When you call it Furrow Books, I’m a big fan of a lot Midwestern design. There’s some incredible designers and work coming out of the Midwest, and when you first told me the name, I initially thought of the Furrows in the field, but when you went into a little more, about the graph and the lines that you put behind that pages – you know to plant the seed, then take it away and you’re left with just the crop or the content. And that was one of the best descriptions that I’d heard as far as that goes. So I sat down and started sketching. I knew it was going to be small. I knew it wasn’t going to be very big on anything, so I figured, something that kept in line with your other business, like the Zeller Writing Company, so I wanted to keep it along that same line, but differentiate it a little bit. The “F” was one of my first ideas. It just seemed to work. The Furrows, the way they were drawn made it looks like rows, but also looked like books. You know, it just like match made in heaven. It was very simple and to the point. People got it. It was kind of like what I talked about earlier, you know. You could have done some big gradient, this or that, or some transparent doo-dad, or whatever; but this was all I needed. This F fit perfectly with what you described and fit with the type. You know, large size, small size, it works no matter if it’s the size of dime or on the side of a building and people can read it and go from there. That was how it turned out and I think it works very very well. How many different designs did you work through or work from? I’d have to go back and look at my sketchbook, but I probably made around 100 different sketches at least. Some of them were originals, some were variations on the ideas that I picked upon, but everything that I did kept coming back to the design that you have now. At that point, I just said that if I can’t think of anything else, there’s no other way and like you know it’s just staring you right in the face that that’s the one. Then I presented it, you liked it, and we went from there. We finished the logo, worked out the belly bands, and everything just kind of fell into place once we realized exactly what we were going for. Were there any specific influences you drew on for the logo? I looked at a lot of fields. I went out to my local farmer’s market and checked out some of that. I looked at a lot on the internet. I know about books and memobooks and different things like that, and I think backfiels said it best, “If you want to design a good logo for a dry cleaner, go spend some time at a dry cleaner.” Forget about asking about what others did for a dry cleaner, and just sit there until something pops. Until you can write something down or draw something out that can represent that. Are there any changes you’d have made to the logo, had you had more of an artistic license for it? I don’t believe so. I mean we believe very well in what we put out. If we feel like something is not right, we’ll fight for it. But, I have no qualms with what’s out there right now. Whether it’s working with the type, with a sans serif vs a serif. You know, but in the end, we wanted something that’s good with everything else and stand out from the rest while keeping with that Midwestern feel; and I think that in differentiating itself and going with the typeface we chose, it was very well done. Generally what you see me put out, I’m 100% supportive of. That’s why a lot time, I might show you a couple options, but we’ll talk serious about what we think would be the best thing. If we’re like, something’s not right, then we’ll scrap it and go back to the drawing board, but I wouldn’t make any changes whatsoever to this logo. Pretty good. I mean I haven’t seen any feedback on the logo. But then again, you have to understand who you’re designing for. I was designing this for you, basically. It was your idea, it was your concept, you know. I mean you’ve been working in this business before and knew what people were looking for in a book. As far as designers that have seen it, they like it. I haven’t heard anything back from your customers, but I think it turned out very well. I think that it’s uniquely your own and separates itself from the rash of memobooks that are on the market right now. It’s not about this cover or that cover, it’s about the content. So, contingent on the success of the Kickstarter campaign, how do you feel about having your work on the thousands of notebooks across the world? Haha, this is where it starts to get real for me. People, a lot of time, work on these big projects that they’re so proud of, which they have every right to be; but then this little mom-and-pop store comes along and they think they’ll just put a little something together for them. I don’t subscribe to that at all. The work that I did for you is the same level of work that I’d do for anybody. We give everything into all of that. But the idea that thousands of people will hold something that has something of mine on it? Yeah, that’s really cool and really humbling. But the idea is that it’s not so much that my logo in their hands, but your book is in their hands. We just helped people identify with something. It was your concept and your idea and we just gave it an identifier, and that was it. That being said, seeing that identifier on this book is pretty darn cool, I’m not going to lie. Aside from the Adobe creative suite and your computer, what tools do you use to create your designs? I always have my memobooks with me at all times, a pen, a pencil, and some drafting tools. Often times you’ll see a fully sketched out version at actual size before I take it to the computer. It takes a little bit of extra time, but if it doesn’t look good there, then it won’t look good in the computer, but yeah, just your basic pen, pencil, and paper. Are there any tools, besides your computer, that you just couldn’t do your work without? I’ve got to have my pencil. You know, that’s where this all comes from – where this all starts. There’s no way I’d be able to do what I do without being able to visualize and sketch it down, make mistakes erase, and start all over again. There’s no way that I could do what I do without that. I honestly find that to be, I mean, I know we need the computers and everything, and I have nothing against these computers and this amazing software that we get use, but if I don’t have my basics, like that, then nothing is going to get to the computer. What’s in your everyday carry? Usually, I have a couple notebooks on me at all times, one pen at least, my wallet, my keys, then a couple of The Studio Temporary stickers or buttons to give out. I try to stay pretty light. Now, including my backpack in that, anywhere I go, I carry my studio with me. I carry a book, the EOOQ book brand bag, I think it’s called Boa. I’ve had that bag now for three years and hasn’t worn out one bit since I bought it. It’s a phenomenal product. I honestly almost called my studio Backpack, just because of how I cart everything around. But that would pretty much be my everyday carry. Do you have any advice for aspiring graphic artists? There’s no quick way to get to where you want to go. There’s no shortcuts. There’s nothing. I have a design degree, but it’s a piece of paper. I was self taught. I learned things through experience and making mistakes. You know, just sit back, buckle down, and do work. It’s not about even doing what you want to do. Your best advertsiement is just doing good work. It’s not about saying that you’re only going to do a certain type of work – only going to do this type of work, or only want to work with coffee shops. It’s just about, whoever you’re doing the work for, do a good job. That’s the best thing I can say. I don’t want to be known for designing a certain type a logo or a certain thing. I want to be known that if you give something to Scott at The Studio Temporary or wherever it is, it’s going to be done right; it’s going to be done well; and it’s going to be done on time. Those are the three things that I really want to be known for. You know, this stuff is fun. I have a fantastic time doing this, and it should be the same with your clients. Treat them well, the same as you’d want to be treated, and just do a good job for them. That will take you so, so far. What’s next for The Studio Temporary? More work. I’m always trying to get more work. Whether it’s blue collar type work, or scouring Facebook for people that need help, or even calling people out of the blue, like I did for you. However that works, I’m always looking for more work. I want to be able to do this for the rest of my life and it’s all just about the next thing. Now we are going to be speaking at Creative South, April 10-12th, 2014. My buddy, Mike Jones, is going to be putting it on in Columbus, GA. We will be leading off the last day of the conference. On the 12th, we’re going to be speaking at 9 o’clock, if anybody wants to show up. That’s what’s next – keep finding more work, working hard, speak and tell our story and take it from there. That maybe the last time we get to speak, but we’ll see. I’m kind of putting everything into that so we’ll see what happens. After an amazing 45-day Kickstarter campaign, we’re so excited to finally say thank you to each everyone of the 983 backers whom believed in the idea of Furrow Books and chose to help us fund the very first production run of Furrow Books. We surpassed our goal of $12,500 and received over $22,000 (just about $20,000 after Kickstarter and Amazon card processing fees.) Between the regular pocket-size packs, regular large-size packs, and both sizes of the Founding Supporter editions, almost 4,000 individual Furrow Books were preordered and are planned to be shipped out in July. We can’t thank everyone enough for all of the support they showed us throughout the campaign – no matter if it was with a pledge in the campaign, or just spreading the word about our project – every little bit helped and Furrow Books would not be produced without you. Now that the campaign is over, surveys have been responded to, and campaign funds have been received (after the 14-day waiting period), production is set to begin very soon and we’ll make sure to keep everyone updated as much as possible through social media and our little corner of the interwebs, here. For those who weren’t able to get in on the Kickstarter campaign, or want to add some more items to your pledge, Furrow Books are now available for preorder, here. We have both of the regular editions, as well as the remaining Founding Supporter editions available for preorder and all preorders will ship out after the Kickstarter backer packages are shipped out – so plan on late July/early August for non-kickstarter preorder delivery. Furrow Books will only be available for preorder for the next few weeks, or until our current production run is depleated. Then we’ll stop accepting orders until everything is shipped out. The official release of Furrow Books, available for immediate shipping, is anticipated to take place in August – so if you’d like to be one of the first to get your hands on some of these beauties, snag a preorder soon! With just under three weeks to spare, we reached our funding goal of $12,500 on Kickstarter – which means that Furrow Books will become a reality! I can’t thank all of you who backed and shared our project and got us to where we are today. It’s amazing the amount of support we’ve received and knowing that these were once just notes on a piece of paper, but will now be produced and thousands of Furrow Books will be in the hands of hundreds of people across the world is almost unbelievable. Even though it’ll still be a few months before these will be in everyone’s hands, we’re still elated at where we are already with this project and can’t express our appreciation enough. While we’ve reached our base funding goal, we have some great stretch goals now posted to help us make sure Furrow Books gets off on the right foot and can come out with new editions and products sooner. At the time of this writing, there’s still about two weeks remaining in the campaign and we’re on track to hit at least a couple of our stretch goals, so if you’re interested in Furrow Books or have already pledged and would like to increase your pledge to help us reach our stretch goals, there’s some time remaining to do so. Our first stretch goal is to hit $16,500, at which point we’ll get some awesome die-cut stickers created and sent out to each backer receiving a physical reward. This is more of our way to say thank you for hitting this milestone along the way to our other stretch goals where we’ll produce some new products. 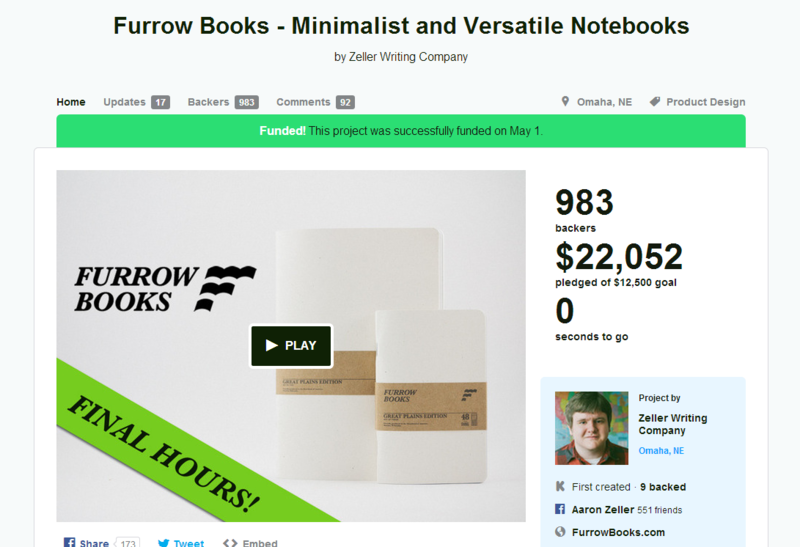 Our second stretch goal is to reach $19,500, at which time we’ll produce 2,500 large-size limited edition Furrow Books. These will be great counterparts to the pocket-size limited edition Furrow Books already available and will only be produced if we reach our stretch goal. They will be available for an additional $10 to any pledge (+$6/$4 for international backers.) Just like the pocket-size Founding Supporter Limited Edition, these beauties will only be available in this ultra limited quantity and each will be carefully numbered by hand. Our third stretch goal is to hit $24,500, at which point we’ll produce three additional ruling cards for the pocket-size Furrow Books – that means six additional ruling options! After we hit our previous stretch goals, we’ll open up voting to the community where we’ll decide which rulings to create. Once unlocked, these three-packs will be available for an additional $4 to any pledge (+$2 for international backers). So with that, I just wanted to extend my sincere appreciation to all of those whom have supported this project so far and to all of those which will continue to support us as we finish out the campaign. We were recently voted the top project for the week of April 7th via CrowdSifter.co and were featured on their blog offering tips on producing successful crowdfunding videos, so feel free to check it out if you’re interested. We’re excited to see where this campaign ends up and are always open to feedback from the community, so feel free to reach out if you have any comments or questions! 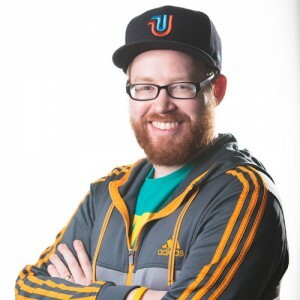 Scott Fuller is an immensely talented graphic designer out of Newnan, Georgia, and was also the artist behind out Furrow Books logo and belly band design. We recently had the pleasure of interviewing him via telephone and wanted to share some of his responses below. This is part one of the interview. Tell us a little bit about your past – how you got into graphic design. I guess I started as most folks do. I liked to draw a lot when I was a kid and was severely into rail roads. The CSX logo is still one of my favorites to this day. I used to draw model trains and draw different themes on them from the time when I was five and six years old. My first commission, if you want to call it that, I had friends who at the time liked trucks, and were always getting rims and grill guards put on them and different things like that. You know, mock me up a cool redneck truck, if you want to say that; and my friends would give me a couple of bucks and I would draw it for them over the course of the week. I’d do side views, draw from life, and make up everything else. That was my first ones. I think I did that when I was about 10 years old. From there, I moved into, I’m a big NASCAR fan, and most designers know the work of Saul Bass who designed the AT&T logo and stuff like that; well I grew up with a different Bass, Stan Bass. He designed paint themes and everything for NASCAR, and that just jumped out to me. So I made the choice to go into illustration and fine art in college. After 2 years, I hated it, and was ready to change back to what I was originally going to go to school for, which was mechanical engineering. I decided to give it one more year, and my first class was graphic design 101. After one hour in the class, I changed my major to design and never looked back. Tell us a little about the Studio Temporary and how it got its name. At the time, I was the director of in-house design at a company, but I had always done freelance on the side and I had just an inkling, that I wanted to have my own place. My dad owns his own company from the time that I was about eight years old to this day and I always enjoyed working with him and doing different things; and I saw how much he enjoyed it, so I thought that was cool, but the fact that I could just do design on my own and make it, you know, was appealing to me. 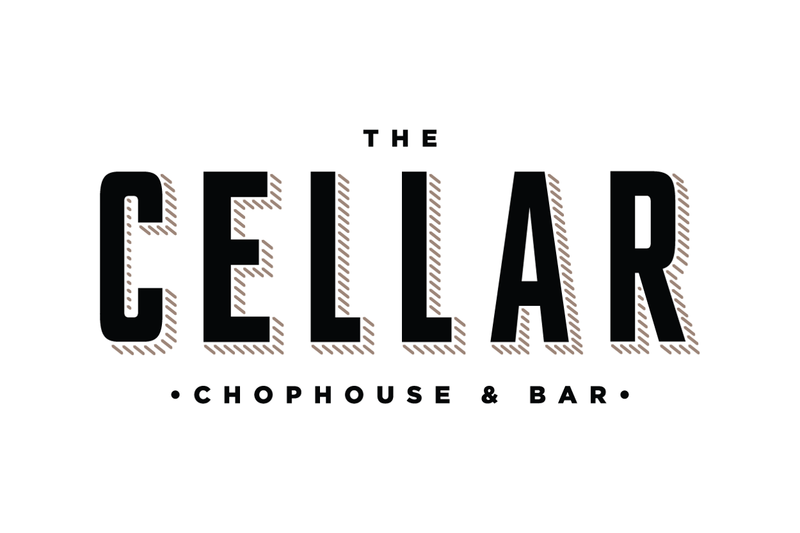 So I tried to build up my base and everything, and I did an identity design, menus and everything, for a restaurant in Newnan called, The Cellar, I took a day off – I called in sick to work – to build the sign at this old sign making shop in downtown Newnan, just right across the street from The Cellar. This guy was ambidextrous; he could letter; he could carve; I mean, he was just this amazing guy. We were in this cool little back room, and I said, “Man, do you ever rent this place out?” because I was within walking distance of the place. He gave me a key, gave me internet access, you know, whatever I needed, and never charged me a penny for almost two years. I’d go there almost every night after work. My first night there, I had been trying to figure out what I was going to call this company, and just as a joke, I called it The Studio Temporary, and after three months, I realized that’s exactly what I was: The Studio Temporary – good design wherever we happen to be. I don’t have a place of my own and I don’t feel that any specific design studio is its location. I think it was Alan Fletcher who said, “The most important tool in my studio is my head.” So, I took that under consideration and threw it all on the line and called it The Studio Temporary and the response was pretty overwhelming. I always got a chuckle and people enjoyed the story and it’s kind of what I became known for. Do you have any other artists working for you? No not right now – it is just me. I have some people that I contract with. I have a developer that I contract with and I have friends in the industry, you know, sometimes they pass me work, sometimes I’m able to help them out, but right now, It is just me. Are interested in expanding with more artists? Maybe one day. Maybe if I have one or two other people, I think would be pretty cool. I don’t feel like growing any more than maybe three, would be idea. Then again, while I’ve worked for people, I’ve never actually worked in a design studio, which is kind of interesting. I’ve never a creative director over me, so it’s kind of hard to say; but If I were to grow, it probably would be no more than a couple of people. I would say it’s kind of utilitarian. I believe that the best designs, just work. You know, it’s not about my artistic license, or any ego, or any agenda that I have. It’s about what works. Some would call it rustic; some would call it vintage; some would call it utilitarian or simplistic, but I just say it works. Each person is different. I can’t approach everything in the same way, because every client and job is completely different. But I come with the idea that it’s the simple things that work. It’s the most memorable. The simpler it is, the easier it is for people to remember, especially using familiar shapes and things like that, especially when it come to logos. I want people to be able to look at it and get what they need to out of it. Whether it’s a logo for Furrow Books or a flyer for medical devices, it doesn’t matter. We want people to get the information and I don’t want them to have to struggle through reading it because it was so poorly designed. I think that each design has a purpose; each logo has a purpose; and if you miss that by throwing in your own agenda, then I would consider that piece to be worthless. I can only think of a couple modern day designers that I really look up to. I would say that Saul Bass, Aaron Draplin, Paul Rand, Jon Contino, Lance Wyman, Malcolm Grear and some others are influences, but a lot of my influence has nothing to do with any particular designer. I’m big into junking and do that quite a lot, and I look at, not necessarily work that’s done from the past, but how they worked from the past. Things like how they used hierarchy and color theory, and different things like that that we just beautiful to look at but were absolutely utilitarian and did exactly what they were supposed to do. You won’t see me reading through design magazine – I have no subscriptions to them. I probably haven’t picked up a design magazine in three years because I don’t want to be influenced by the fads of today. You know, people consider nowadays, vintage is a fad, it’s in now, and I don’t see it as vintage really. I see it as a way to do something that’s hand crafted as opposed to something that’s done quick or something that just follows the fads or whatever of today. So, my influence is more along the lines of work from the past. So that’s it for part 1. Stay tuned for part two where we talked some the Furrow Books logo and how he went about creating that along with some advice for other graphic artists out there. Also, for those in the Columbus, GA area, Scott will be speaking at Creative South at 9am on April 12th. So stop by and have a listen, you wont’ be disappointed. You may even grab some Studio Temporary swag if you’re lucky. The first regular edition from Furrow Books pays tribute to the Great Plains – the heartland of America, and home to Furrow Books headquarters, Omaha, Nebraska. 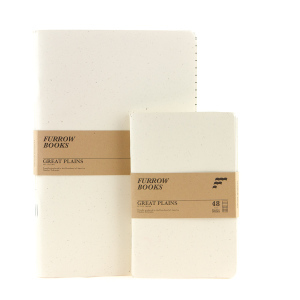 Just as the Great Plains provide a strong foundation for our nation’s agriculture, this edition of Furrow Books provide an exceptional foundation for unrestricted creative expression through its ultra minimalist design and highly versatile application. The cover and two-sided inserts are made of 80# Neenah Royal Sundance Birch Fiber stock, which contains flecks of natural material, reminiscent of the grains and other flora of the region. While the printing on the covers is minimal, we made sure the quality is just as you would expect coming from the Midwest and used offset printing methods with black ink. The insert cards, printed with the same black ink, provide you with the opportunity to use 1/4″ lined or 3/16″ graph ruling anywhere within your notebook. Each Furrow Book contains 48 or 96 (pocket or large sizes) blank pages of 100% PCW recycled and acid-free 60#T Rolland Enviro100 white paper, which has a wonderful texture, is filled with small tan-colored fibers on close inspection, and is compatible with a wide variety of writing instruments. To complete the Furrow Books, each notebook is saddlestitched with a few durable staples and given a nice 1/4″ rounding to its exterior corners before being stacked in set of three (pocket-size) or two (large size,) wrapped with a bellyband, then heat sealed to preserve freshness. As this is a regular edition, they will be reprinted as necessary to always be available when needed.